Each one happens to be attached to a cardboard base, generally I try to find reasons not to use cardboard due to it’s warping problems, but these are small enough that it shouldn’t be an issue. The pieces are a combonation of PVC pipes that were obtained for $2 at a local Thrift Store. The rest of the bits come from the aforementioned model kit. The results are a Sci-Fi looking above ground structures that will provide various hiding places for your gang in Necromunda or whatever other Sci-Fi game you come across. In the end we now have some ground-level terrain that isn’t a “Ruin” or something that’s broken. These structures were built in tact and act as a great addition to our existing Sci-Fi terrain. 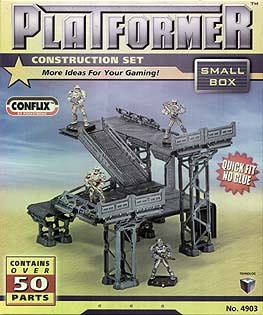 This entry was posted on Tuesday, June 23rd, 2009 at 10:22 am	and is filed under 5150, Necromunda, Sci-Fi, Terrain, Wargames. You can follow any responses to this entry through the RSS 2.0 feed. Both comments and pings are currently closed.